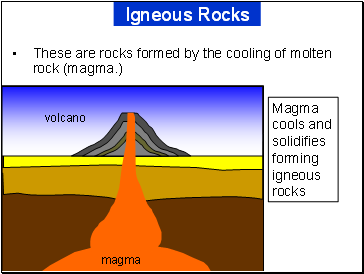 Igneous - formed when molten rock cools. 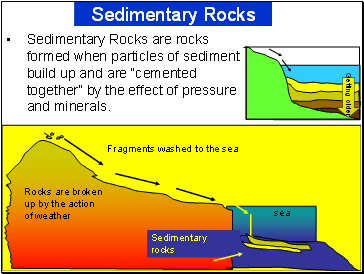 Sedimentary – formed by the “cementing together” of small grains of sediment. 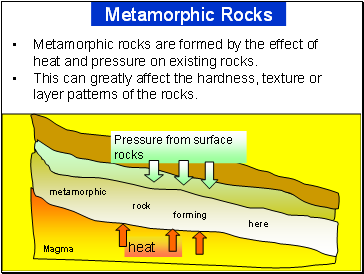 Metamorphic – rocks changed by the effect of heat and pressure. Sedimentary Rocks are rocks formed when particles of sediment build up and are “cemented together” by the effect of pressure and minerals. 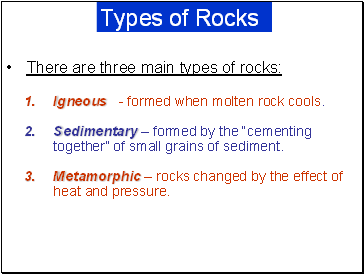 Metamorphic rocks are formed by the effect of heat and pressure on existing rocks. This can greatly affect the hardness, texture or layer patterns of the rocks.